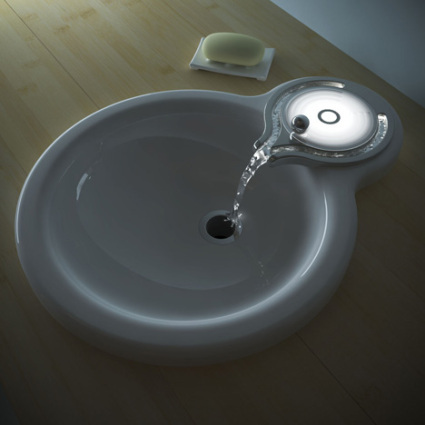 The Ripple-15 faucet is so dang cool, every house should have one. But with such a hypnotic addition I fear we'd all waste a lot of precious water that way due to excessive overuse. Consisting of a simple rippled circle display and an electromagnetically attracted metal ball, you can change the temperature of the water by simply placing the metal ball either along the hot or cold side of the plate. 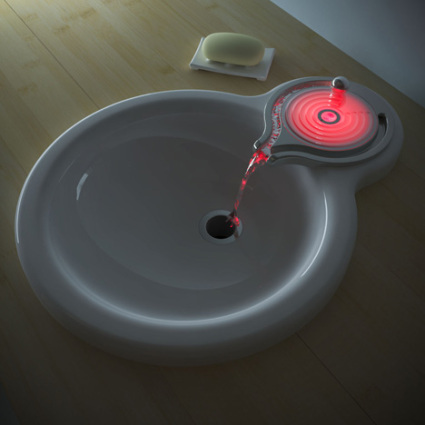 Electromagnetic sensors housed beneath the plate adjust the temperature according to the ball's placement, and LEDs light up in red, blue or neutral to visually cue you in as well. A flash heater regulates the water and heats or cools it accordingly, while two separate channels direct the hot or cold water flows. 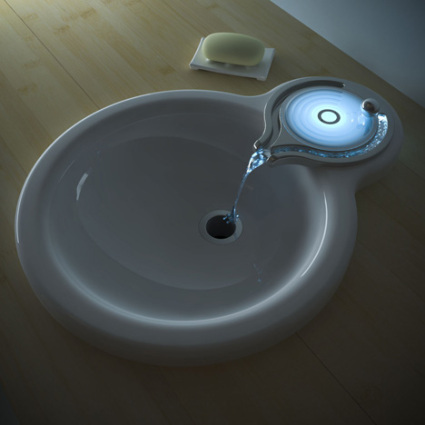 Moving the ball to the outer concentric rings increases the water flow, while placing it in the center turns the faucet off. Ripple-15 is the fifteenth version of an initial concept, and with it designer Smith Newman appears to have perfected his craft. Only thing I'd be worried about is that little metal ball meeting a cruel fate in the depths of the drain, or in some little person's stomach. Oh, who am I fooling? I still want it. Protect Feet and Country With Sanitary Socks: Great Idea? Attach ball using super magnet. THe harder you try to pull the ball away the more powerful the magnetic force. But nobody has mentioned the fact that the sink has to be COMPLETELY level. While the ball would not be able to move in or out (turning the water flow up or down) the ball could supposedly move to room temp (or wherever the low point is) by itself. I dont see any grooves that keeps the ball in place, so as the house (or cabinets) settle over time, the sink will become askew.